Sometimes, when I talk about the value of contemplation, someone will say that contemplation is a cop-out, an escape from the world's needs. But my experience with activism tells me otherwise, and this quote from Thomas Merton explains why. When we fall into the frenzy of overwork, we do violence to ourselves and kill "the root of inner wisdom which makes work fruitful." The results can range from unmanageable anger to sullen resentment to burnout, all of which lead to misguided action—and ultimately take us out of the action. We need to expand our understanding of "violence", a concept that goes well beyond doing physical harm. We do violence every time we violate, or fail to respect, our own or another person's soul. Psychological and spiritual violence do as much harm in their way as bombs and bullets do in theirs. P.S. About the photo: Thomas Merton and the Dalai Lama met in Nov., 1968 in Dharamsala, India where the Dalai Lama was living in exile. They quickly recognized each other as "soul brothers" and doubtless would have continued to work together. But Merton died in Bangkok just one month later at age 53. 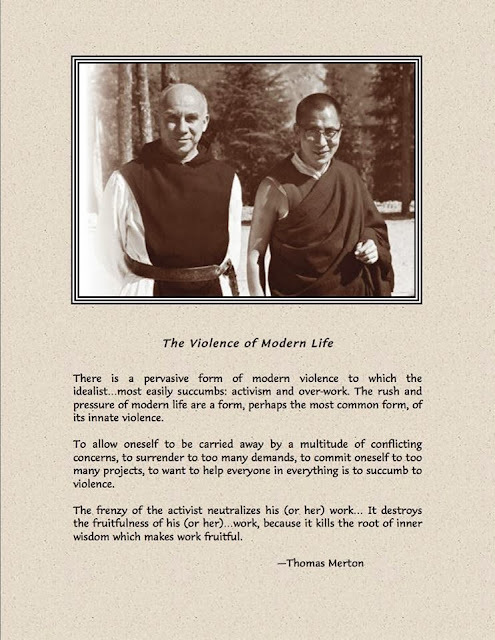 It's one of history's most instructive ironies that Thomas Merton and the Dalai Lama, both deeply committed monastics, have had a huge impact on the peace movement, the racial justice movement, and other forms of activism all over the world.